Chicago Public Schools was closed Monday and Tuesday due to the extreme cold temperatures and high winds that remain in the area. 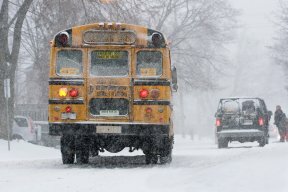 District officials continue to monitor the weather conditions, but Tuesday’s expected continuation of subzero temperatures and high winds will make it dangerous for children and families getting to and from school. For families seeking alternative youth programs and services, all Chicago Park District facilities will be open during normal operating hours. These times vary, so please check hours for specific parks on the Park District website or by calling the specific park.